The Anne Arundel Genealogical Society wants to help you discover more about your family history. We invite you to become a member, visit our research center, browse our website, and attend our monthly presentations and special events. Our Historical and Genealogical Research Center at the Kuethe Library in Glen Burnie houses more than 6,000 books, many photographs, maps, CDs, and obituary, bible, and church record collections. Because our history is so connected with our neighboring counties and states, we have an extensive collection of material from across Maryland and surrounding states. Perhaps our most important asset is our staff of experienced genealogists. The people you will meet at the Kuethe Library and at our meetings have a wealth of experience and knowledge they are always willing to share. Beginning, intermediate, and experienced family history researchers will find resources both usual and unusual in the Kuethe Library. Our monthly meetings feature presentations by experts on a wide variety of genealogy topics. Visitors are welcome. Let us know how we can help you with your family history research. Interested in the latest additions to our website? Check out our What's New ? page. AAGS Spring Seminar - May 11, 2019 - Register below. Join us on Saturday, April 20, 2019, from 10 am to 1 pm at Glen Haven Memorial Park, 7215 Ritchie Highway, Glen Burnie, MD for our second fall Cemetery Inscription Day. Help us transcribe information from tombstones and grave markers for use in genealogy research. In addition to our usual manual transcription, we will use the BillionGraves app to record cemetery data. If you want to use the app, download it to your phone, set up an account, and make sure your phone is fully charged before you arrive. If you have questions, or in case of inclement weather, contact Tina Simmons at tinasimmons622@yahoo.com or 410-978-7167. The Anne Arundel Genealogical Society cordially invites you to its 2019 Dinner & Elections. Speaker: Franklin A. Robinson, Jr.
Franklin A. Robinson, Jr. is the author of Faith and Tobacco: A History of St. Thomas' Episcopal Parish, Prince George's County, Maryland. Published in 2015, the book tells the story of how faith and income from tobacco farming built and sustained St. Thomas' Parish. He will speak about the parish and emphasize the families who were its members. An archives specialist at the National Museum of American History, Smithsonian Institution, Mr. Robinson holds a Bachelor of Fine Arts degree from Catholic University of America and a Master of Arts degree from American University. He is a member of the Board of Trustees of Maryland Historical Trust, recipient of the Maryland Historical Trust's Preservation Service Award, and former chair of the Charles County Historic Preservation Commission. Faith and Tobacco received an award of merit from the National Episcopal Historians and Archivists group in 2017. To register below and pay using PayPal or a credit card, make a dinner selection and click the “Add to Cart” button below. To pay for more than one dinner, please choose "Continue shopping" in "Your shopping cart" to go back and add each dinner to your cart. Review your cart, then "Check Out." If you have special needs, add "special instructions to the seller" where indicated on the "Review Your Information" page at final checkout. To register by mail, click here for a registration form to fill in and mail. Join us on Thursday, June 6 at 7:30 pm at the Severna Park United Methodist Church, 731 Benfield Road, Severna Park, MD, as Lee Wolff-SIlver offers a case study on finding two of her ancestors in he 1940 census. When the 1940 U.S. Census was released, Lee Wolff-Silver eagerly began to search for family members. She quickly found her father, Sidney Wollf, who was living with his parents and a younger sister right where Lee expected to find him, in Richmond Heights, Missouri. She found her father-in-law, Abraham Richard Silver, in Boston, Massachusetts, just where she thought he would be. However, after hours of searching the 1940 census records for her mother and mother-in-law, Lee was baffled. Where were these two ladies? Lee Wolff-Silver started doing genealogy during a pregnancy, in the 1980s when her doctor suggested genetic testing. Her husband’s family and her grandfather were from Eastern Europe. 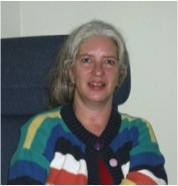 Testing discovered that her husband was a carrier of a genetic disease but she was not. Crisis averted. But that started her journey into genealogy, using an Apple IIc computer and Family Tree Maker. The computer changed over the years, records became more accessible, but her love of the hunt has not changed. After retiring from the Federal Government, Lee has more time to spend on her family tree. Most of her family is from Missouri, which has great online resources. Two of our publications, Anne Arundel County, MD Wills Index 1777-1918, and Anne Arundel County, MD Marriage Records 1777-1877, are now available to our members in searchable pdf format. The Wills Index provides an alphabetical list of the primary persons in each of the Anne Arundel County (Maryland) will records between 1778 and 1918, and contains the names of over 3,700 persons, the book number and page number where the record is located at the Maryland State Archives, and the year of the record. The Marriage Index is an index for brides, with 4,736 marriage records. Click on the links above to preview these publications. Members can access complete copies in Readings Online after logging in to our website. And in case you missed it, pdf copies of The Old Stone House, by Margaret Sparrow, and Louisa C. McPherson's Book, edited by Ray Ringgold and indexed by Audrey Bagby, are already available to our members in Readings Online. If you prefer hard copies of the Wills Index or Marriage Records, you can still purchase them for $5 in our Store, while supplies last. Are you just getting started with DNA? Or is your DNA research at a standstill becuase you just don't know how to start weeding through your hundreds (or thousands) of second, third, and fourth cousins. Well if you're an AAGS member, do we have a member benefit for you! Each Bootcamp includes two webinar recordings and several handouts. The Bootcamps are only accessible to our members who are logged in to our website. Once you have logged in, a new item, "DNA Bootcamps", will appear on the menu to the left. Click on it to access the Bootcamps. If you have any trouble logging in to our site or accessing the Bootcamps, please contact us at web@aagensoc.org. We also welcome your feedback on the Bootcamps, and your suggestions for future member benefits. This is the eighth volume of a series started by the Anne Arundel Genealogical Society. It covers the period of 1754-1763. While the title is Abstracts of Land Records there is much more than just land transactions in these volumes. They include all the transactions recorded by the court clerk. The abstracts of land transactions include basic information including; grantor, grantee, date of deed and of recordation; consideration paid, and release of dower. Many of the transactions are not sales but what today we would call a mortgage or a loan. Collateral for such loans were the land, indentured servants, slaves, animals, and other items of value. Other actions recorded include the finding of stray horses, the ships and freight rates for sending tobacco to London, the release of soldiers, and other matters. Some of the transactions were carried out in Great Britain or other Maryland counties but involve current or former Anne Arundel County residents or property in the county. 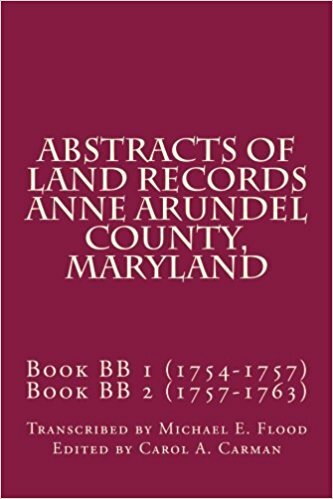 Abstracts of Land Records, Volume 8 can be purchased on Amazon.com. Click here to buy your copy. Planning to Visit the Kuethe Library? You can make the most of your time by doing some research online before you arrive. More than 5,000 of our books are now listed in the Anne Arundel County Public Library catalog. We’ve also posted indexes of our Bible records, genealogy (surname) files, and more here on our website. And we are working on an index for our Anne Arundel County obituary records. Take a few minutes to check these resources at home so you can head straight to the information you need when you arrive. We hope to see you soon at the Kuethe Library! The Anne Arundel Genealogical Society together with the Ann Arrundell County Historical Society is working on a project to add the Kuethe Library holdings to the Anne Arundel County Public Library catalog. As of February 2019, there are more than 5,000 Kuethe titles in the public library catalog. Keep watching here to monitor our progress! And check out the AACPL's Kuethe Library page! How can I access Kuethe Library holdings in the AACPL catalog? Already on Facebook? Log in to your Facebook page, then enter and choose Anne Arundel Genealogical Society in the search box, and ask to join. We have just reached 521 AAGS Facebook Group members! New to Facebook? Go to www.facebook.com. Provide the information requested to set up your free account. Then you can "friend" other Facebook members and share your comments, photos, videos, and favorite websites. You can join groups (AAGS, for example) and send public and private messages to your Facebook friends. It's a great way to meet other genealogists and maybe even make contact with long lost relatives. Give it a try!